Steve is President of the Railroad & Locomotive Historical Society and is on the Board of the Union Station Foundation. These leadership credentials have given the restoration team of the Denver and Rio Grande steam engine #223 the inside track to financial and community support. Steve can’t claim any relatives who worked for a railroad and he has no working railroad experience. He fondly remembers his father taking him from the family farm in Pennsylvania to the amusement park to ride on a steam train. Even though it didn’t go very far, it burned a lasting memory in his mind. The thrill remains! 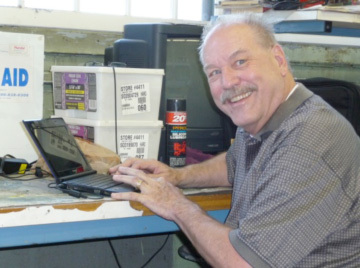 Steve followed his wife when she came to Ogden to work, and with a couple of computer science degrees, began his own building automation systems company. Steve believes that what he is doing is preserving history which would have been lost without the work of the volunteers.